As we head into the long holiday weekend, hopefully full of fun, parties and friends, I thought I'd share some entertaining inspo! Recently, LA-based designer Jenni Kayne, stylist Jessica de Ruiter and I threw a festive, get-ready-for-fall luncheon. Of course, there was a fashion twist: we asked all our guests to wear a piece from Jenni's new fall collection and style it all their own. 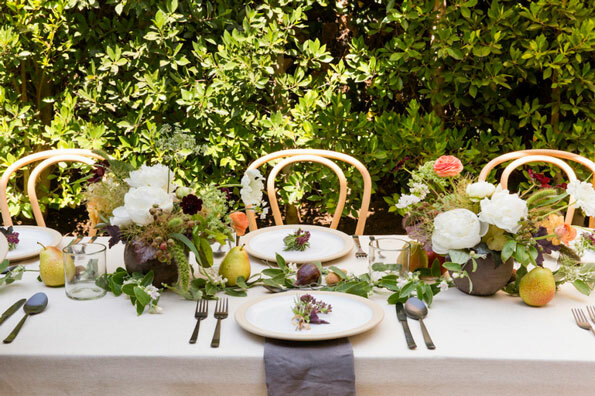 Naturally, we needed a suitable setting for all this chicness, so we situated ourselves in Jessica's gorgeous Silver Lake backyard and decked out a long table with blooms from Twig & Twine, a Hollywood florist known for mixing flowers, foliage and fruit. For food, we turned to Silver Lake favorite Sqirl for their signature healthy yet delicious dishes: vegan "Kabbouleh" salad, baked white fish with tumeric, Koda brown rice with dill and grilled broccolini with chili chimichurri. Topping things off was an incredibly tasty gluten- and dairy-free hazelnut torte with juicy Blenheim apricots. YUM! For recipes and to see more mouth-watering snaps, click here. Enjoy!